The great city of Charleston is known for its rich history, delicious coastal cuisine, and Southern charm. You can experience all three of these at the Charleston Wine and Food Festival in March. This premier event features a wide variety of tastings, dinners, workshops, and excursions that give you an insight into the top-notch flavors of the South’s top culinary experts. So prepare your palate for the time of its life as you experience the best that Chucktown has to offer. While you’re in town, you’ll want to check out the incredible attractions, restaurants, and activities. Request our free Vacation Guide so you can easily plan your trip before you get arrive! Before booking your experience at the festival, check out each unique activity taking place around the city from March 6-10. Take a look at the featured chefs, types of events, and much more! The Culinary Village is the heart and soul of the Charleston Food and Wine Festival. This event takes place in Marion Square, located in the heart of downtown. Here, you can walk around and sample food and wine, watch live cooking demos, listen to live entertainment, and more! Signature events give you the opportunity to experience food and wine tastings in unique atmospheres around the city. Whether it’s a Lowcountry Boil in the Old Cigar Factory downtown or a seafood tasting at Mount Pleasant Memorial Waterfront Park, each one of these events is the perfect way to experience delicious cuisine in a fantastic setting. Signature Dinners at the Charleston Wine and Food Festival showcase nationally acclaimed chefs and restaurants throughout the city. These multi-course dining experiences area great way to treat yourself to an extra special evening! Wanting to learn the art of making cocktails, sample fantastic wines, and discover the latest and greatest craft brew? The Beverage Workshops provide you with the opportunity to sample some of the best local libations in a fun, educational program. Charlestonians love their brunch, and that is on display in this series of Brunches + Lunches. In addition to an assortment of to-die-for breakfast and lunch options, there is a fantastic beverage pairing special featuring champagne, wine, beer, and cocktails! Learn more about what makes the city of Charleston so unique on one of the Excursion tours. They are a great way to get a taste of history, beautiful scenery, and cuisine in one package! So, you still want to learn how to be a master chef and recreate all of those mouth-watering dishes you see on TV. The Hands-On Classes at the Charleston Wine and Food Festival give you the tools to be the head chef of your kitchen at home (while sampling some tasty food of course). Tip: This is one of the most acclaimed events of the year. If you’re considering attending the event, buy your tickets as soon as possible. It books up very quickly so make sure you check out the schedule to see what’s still available! Spend Your Spring Vacation at an East Islands Rentals Home! Want to know the perfect way to cap off a day filled with food and fun at the Charleston Wine and Food Festival? Spending your evening sitting on the porch of your East Islands Rentals oceanfront vacation home, of course! Our collection of rentals stretch across the beautiful Isle of Palms, where pristine beaches and great weather make for an incredible spring vacation! 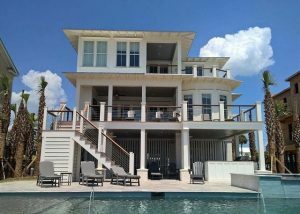 Take a look at our complete list of rentals to find the perfect beach vacation home today! We hope to see you for the Charleston Wine and Food Festival!